Today's spotlight Blu-ray deal at Amazon literally comes out of nowhere! 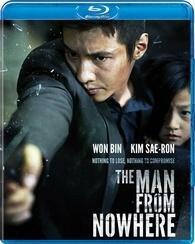 The online retailer is selling 'The Man From Nowhere' for $13.99 (48% off suggested price). Written and directed by Jeong-Beom Lee ('Cruel Winter Blues'), 'The Man from Nowhere' is the biggest grossing film of 2010 in South Korea with a box office total of $45 million. Click here to add this excellent title to your Blu-ray library!